Judaism is not a spectator sport. It is an extremely participatory religion and culture, rich with symbols and practices that bring meaning to milestones in our lives. From the moment we are born until the day we die, the celebrations and commemorations along the way imbue our journey with spiritual significance. They give us a time and space to pause and reflect before we jump back into our day-to-day preoccupations. Although nuances and details vary among the denominations, by observing these lifecycle events, we acknowledge a respect for human life and the presence of a divine connection. Jews celebrate new life with a brit milah (also called a bris) for boys and a simchat bat for girls. At a bris, which is held eight days after birth, the infant boy is circumcised by either a trained ritual circumciser, known as a mohel, or a physician. This circumcision affirms the child’s status as a Jew and his inclusion in the covenant established between God and Abraham. The simchat bat is a ceremony that celebrates the naming of a baby girl. There are no specific requirements about when it should be held. Both ceremonies are traditionally followed by a festive meal for the family and guests. When a firstborn son is 31 days old, his parents symbolically redeem him from service as a priest by offering five silver coins to a Kohen (a member of the priestly caste). This ritual does not need to be performed if the father is a Kohen or Levi, the mother is the daughter of a Kohen or Levi, or the child was born through cesarean section. When a Jewish family moves into a new home, one of the first things they do is attach a mezuzah to the doorpost of each door (except bathrooms). The mezuzah, which literally means “doorpost,” is a decorative case that contains a parchment scroll with verses from the Torah, “Inscribe them on the doorposts of your house and upon your gates.” (Deut. 6:9 and 11:20). The name of God, “Shaddai” is written on the outside of the scroll, with the three Hebrew letters standing for “Shomer Delatot Yisrael” (Guardian of Israel’s Doors). There’s also a Hebrew inscription at the bottom of the outside of the scroll, which is meaningless unless you substitute each of the letters with the letter that comes before it in the Hebrew alphabet. Then it spells “Adonai Eloheinu Adonai” (“the Lord our God is the Lord”). During a chanukat bayit (housewarming), we affix the mezuzah diagonally around eye level on the right doorpost, as you enter, with the top tilted inward. We recite a blessing and the Shehechiyanu to thank God for bringing us to this moment. According to Jewish law, a divorce becomes official when a get (divorce decree) is given by the husband and accepted by the wife. Since Jewish marriage involves a legal contract between a husband and wife, it can only be ended by a legal document that nullifies that agreement. The divorce must first be finalized in civil court, before the get can be granted. The get must be written by a sofer (religious scribe) and delivered in a beit din (religious court) with witnesses present. The rituals that honor the dead are considered the most profound mitzvot, because they cannot be returned or acknowledged. They include ritual washing and guarding the body. Burial must take place as soon as possible. The deceased is buried modestly, in a simple shroud and a plain wooden casket or, in some cases, directly in the ground. At the funeral, mourners tear their garments or a black ribbon, just as the patriarch Jacob did when he was told that his son Joseph was dead. Afterwards, the mourners return home to a meal of condolence, which includes round foods, like hard-boiled eggs and rolls, that symbolize the circle of life. 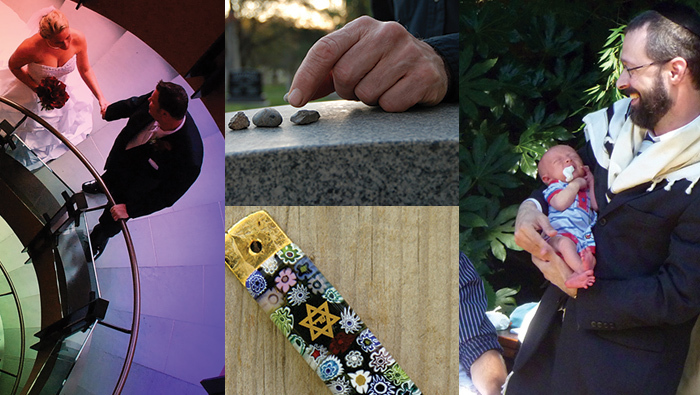 Jewish tradition recognizes that mourning is a long-term process, which doesn’t end after the funeral. After the burial, the immediate family spends the first seven days sitting shiva, when they receive condolence calls and do no work. The community takes care of their needs. The bereaved recite the Mourners Kaddish prayer for 30 days when mourning a spouse, sibling or child. For a parent, children continue reciting Kaddish for 11 months, although they are still considered to be in a state of mourning for one year. At the end of the year, an unveiling is held to reveal the headstone, which should be simple and not ostentatious. When visiting a cemetery, Jews often place small stones on the headstone to show that they have not forgotten the deceased.